Picture Weave Christmas 2011 gifts. Free Shipping. Order 7 days a week,to avoid the holiday rush! Christmas 2011 is nearly 2 months away. Order by December 1, 2011 for guaranteed Christmas delivery. Imagine weaving your photo, your child's artwork, or business logo into a personalized picture throw(afghan), totebag, wall hanging, or purse. The PictureWeave process achieves this by jacquard weaving a phot0(.jpeg) file into a 100% machine washable fine art tapestry. 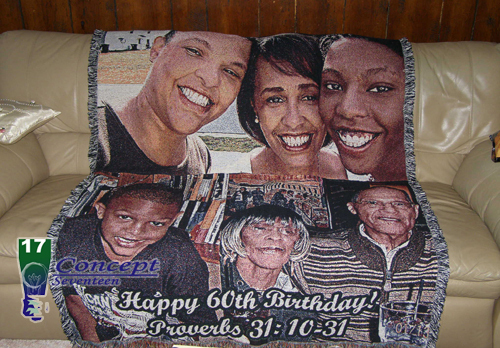 A PictureWeave gift is wonderfully suited for Mother's Day, Father's Day, Weddings, Graduations, Family Reunions, Anniversaries, Birthdays, and Christmas. If you have difficulty finding the perfect and unique gift, Picture weave is the answer in 2011. Picture Weave Afghans(Throws) -54x70in. (most popular). Picture Weave Pillows - 17x17in. Picture Weave Wall Hangings- 36x24in., 54x40in., or 54x70in. Picture Weave Tote Bag - 17x17in. Picture Weave Purse - 17x12in. Ordering from us, assures you a "piece of mind"
Recommendations for choosing a photo that weaves well. Bad photos make bad products. DIGITAL: The larger the photo, the better. 400 kb or larger. No camera phones pictures. SCANNING: High resolution(at least 180 dpi) of 4x6in min. Receive confirmation the picture has been approved within 24-48 hours 7 days a week. We work weekends. Delivery-Free US shipping on final product via FedEx or UPS Ground. APO/APE or International shipping is available at a surcharge required up front. The Package page is dedicated to selling multiple individual products and various combinations at lower prices to fulfill all of your gift giving needs. To be redirected click on Package. If It Can Be Photographed, It Can Be Woven." MSRP $98.00 $88.00 Full color 16 x12 inches woven handbag with black handle and magnetic closure. Fully lined and pocketed. Jacquard woven, hand finished. Comes standard with a black fleur-de-lis rod and wall mounting hardware. 53 in. x 40 in. MSRP $320.00 - $280.00 Comes standard with a black fleur-de-lis rod and wall mounting hardware. MSRP $450.00 - $390.00 Comes standard with a black fleur-de-lis rod and wall mounting hardware. See what our customers are saying about the products and services at Concept Seventeen. thanks for having everything arrive on time… everyone thoroughly enjoy the afghans… and couldn't get over the clarity… hopefully we will be doing business again in the future. The afghans were BEAUTIFUL!! It was a jaw dropping gift and one that I am sure they won't soon forget. Thank you so much for the picture blanket. As we were opening gifts after the wedding, the whole family really liked it-very unique. It now lives on our couch and all our guests comment on it. The afghan was a smashing success. We had the extended family over for exchanging gifts and everyone was talking about how beautiful it was and what a great idea. Most of them were on the cruise with us so they remembered when the photo was taken and they were amazed at the details in the weaving. COPYRIGHT: Picture cannot be copyrighted or it must have a copyright release from the photographer or studio if even it appears professionally done. In addition, we cannot accept photographs of copyrighted materials, such as theme characters and sports mascots. SIZE: 5 in. x 7 in. minimum, but the larger the photo, the better, up to an 8x10. ORIGINAL PICTURE: Please submit a copy of the photograph. BLACK & WHITE PHOTOS: These pictures are fine as well but the finished Picture Weave product will be in Black & White if your photo is in black & white. GROUP PHOTOS: You are entitled to have as many people in a photo as you like but remember the smaller the detail, the less likely it is to show up in a woven piece. A blanket with a couple of large faces will yield higher detail in those faces compared to a photo with 10 people in it. CONTRAST: A high contrast picture works best. If your main subject is brightly lit and the background is somewhat dark, the results will be brilliant! FOCUS: Make sure the subject is sharp. The better the picture, the better the finished product. DETAIL: Almost every detail, whether good or bad is caught by Picture Weave. For example, if an old picture has a crack in it, that crack will show up in the Picture Weave Product. COLOR: Try to choose a picture with realistic coloring because whatever you send is what you will get in the final product . COMPOSITION: Keep it simple and make sure the main subject occupies between 60-80% of the photo so that more detail can be seen. This way, colors will also be more vibrant and true-to-life. By providing us with great pictures, then we are able to provide you with the most amazing finish product. This is a collage photo afghan(throw) and not a picture, see the fringes. Copyright © 2006-11 Concept Seventeen, LLC.